Little Domingo (Dominguito) del Val blossomed like a flower on the shores of the Ebro, spreading his perfume at the feet of the Virgin of the Pillar. Altar server of the Seo de Sargoza, he had already distinguished himself at twelve years old by his piety and his compassion towards the poor. He seemed like an angel as he helped at Holy Mass. But one day he disappeared and, after a long process, it was learned that the Jews had stolen him so as to reproduce in his innocent body the supplications of the Passion of Our Lord. It was on Good Friday of 1250. Prayer. – Oh God, who conceded to St. Dominguito, an innocent martyr, the prize of eternal life: make, we beg Thee, that supported by his merits and prayers, we may be worthy to enjoy eternal happiness. Through Christ our Lord. Amen. 1250. 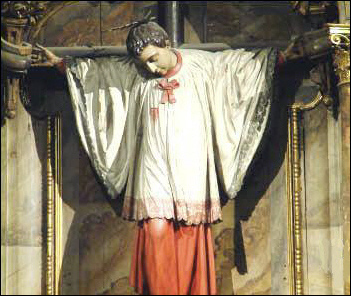 Zargoza (Spain) Child crucified by the Jews, canonized as St. Dominguito del Val. His feast day is celebrated on August 31. The Sacred Congregation of Rites confirmed the cult of the holy child, given by decree on November 24, 1805, under Pope Pius VII. The holy cardinal Raphael Merry del Val, Secretary of State to Pope St. Pius X, belonged to the same Spanish noble family as St. Dominguito.